The USS Monitor was the Union's response when they realized the Confederate Navy was converting the USS Merrimack into the first Confederate ironclad, the CSS Virginia. In 1862 ironclads were something new. Only a few years earlier the French and the British had developed ironclads. These were seagoing ships with a full complement of sails suitable to fight in the open sea. The needs of the Confederate ironclads were quite different. Their purpose were to break the blockade the Union had imposed on them as part of the 'Anaconda plan'. Instead the Civil War Ironclads were developed as river, inshore, coastal defense or harbor defense ironclads. An entire different approach to the design was established. For instance, the rigging was eliminated and stores were limited to last days rather than months. The Monitor was a radical design. To pose a minimal target, the freeboard was only 1 1/2 feet. Her armor belt was five layers of one-inch iron plate backed by more than two feet of pine and oak. Her deck was almost flat with two layers of one-inch iron plate backed by seven inches of pine. The Monitor was the first warship with a rotating turret. It was driven by its own two-cylinder steam engine. The armament consisted of two eleven-inch Dahlgren smooth bore cannons – the largest cannon available in the US Navy at the time. When not engaged in battle some fittings would be mounted such as: the canvas canopy above the turret and its stanchions, funnels and vents on deck. In preparation for battle these items would be stowed away. 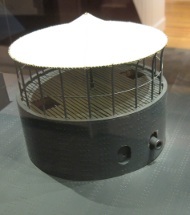 A birds perspective of the turret of the USS Monitor. The model is at the Mariners' Museum. The rivets for the deck plating were countersunk. This means the head of the rivets would be flush with the surface of the plates. This makes sense, because otherwise the crew would trip on them. The rivets on the turret are regular round-head rivets. The heads are 2 1/4 inches across. The Monitor went on to fight the CSS Virginia on the second day of the battle of Hampton Roads on March 9 1862. The battle was unlike any sea battle before. The ships were firing away at each other at close range and both were attempting to ram the other. The battle lasted for four hours and ended in a draw. After the battle both vessels were in serious need of repairs. The appearance of both vessels were likely changed as improvements were made after lessons learned from the battle. Some notable change to the Monitor was the shape of the pilot house and the funnels. The pilot house was nothing but a rectangular box at the day of the battle. During refit sloping side armor was added to better deflect shells and shot. This was as a result of a direct hit on the pilot house during the battle where debris temporarily blinded the commanding officer - Lt Worden. Before the battle the two funnels were rectangular in shape, located aft of the turret. Sometime after the refit, the funnels were teed together into a single round telescoping funnel. Davits, ship's boats were also added. A full scale replica of Monitor's turret as it was found over 100 years after the loss. Monitor Center, Newport News, VA. Both the CSS Virginia and Monitor had short careers. The Virginia was destroyed by the Confederates to prevent her from getting into Union hands. The Monitor was lost in a gale soon after, off the Cape Hatteras while under tow. Sixteen of her crew were lost with her. Since her wreck site was discovered in 1973, several artifacts have been recovered, such as her revolutionary steam engine, anchor, propeller and the entire turret. The anchor and propeller are on display at the Monitor Center (as part of the Mariners' Museum in Newport News, VA) while the turret and engine (among other artifacts) are still in the process of being stabilized for conservation. 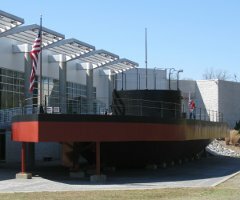 A full scale replica of the USS Monitor built and donated by Northrop Grumman. Monitor Center, Newport News, VA.
You can purchase and download the high quality Monitor Plans in PDF format by following the link. Lindberg / Pyro - injection molded - #77257 "Monitor & Merrimac" an old kit of both ironclads. Interestingly enough, they are in different scales. USS Monitor at 1:210 and CSS Virginia at 1:300.